On the outside, Xavier Hendrix is a normal young man. A successful high school football player who made the jump to college football at Southeastern University. He was all set to play, until he received a devastating diagnosis from his school’s athletic trainer. Xavier learned he had an abnormality with his heart and would need to follow up with a cardiologist. For a healthy freshman in college, it was easy to feel nothing was wrong. But there was a problem. As further testing revealed Xavier had Wolff-Parkinson-White Syndrome — a disorder in which there is an extra electrical pathway between the heart’s upper and lower chambers that can cause a dangerously rapid heartbeat. That’s also when the cardiologist informed Xavier he would never play football again. “When it first happened it was really tough. It was really raw. So it took me a little bit to get back out on the field and to realize that this isn’t what God wants me to do in my life anymore," said Xavier. Xavier chose the surgical rout to eliminate any further issues. But that involved its own risks, including stopping his breathing and his heart to burn off the extra tissue. His first surgery went well beyond its time limit. Scary didn’t begin to describe the emotions felt by Xavier’s mother, Marianne, who remembers waiting and waiting for her son’s surgery to end. The surgery would be deemed a failure, as doctors were unable to get to the tissue. For a nervous family, the news was devastating. “You can ask my husband and daughter, I just slid down the wall of the hospital and started crying and screaming and not understanding why," said a mother who was in need of hearing good news. A second surgery came and went without success. While the problem remained, the solution was found. Doctors would stop Xavier’s breathing and use a crucial thirty second window to cut the tissue. The third surgery came on November 20th, just two days before Thanksgiving. When we met with Xavier just days before his procedure, he was convinced this time would be the last. "This is the third and final time. I trust these doctors with my life," said Xavier. And it would be his last. Doctors were successful in removing the tissue. “When I woke up I could feel the difference," Xavier said with a smile. Xavier was home for Thanksgiving, thankful for his health. 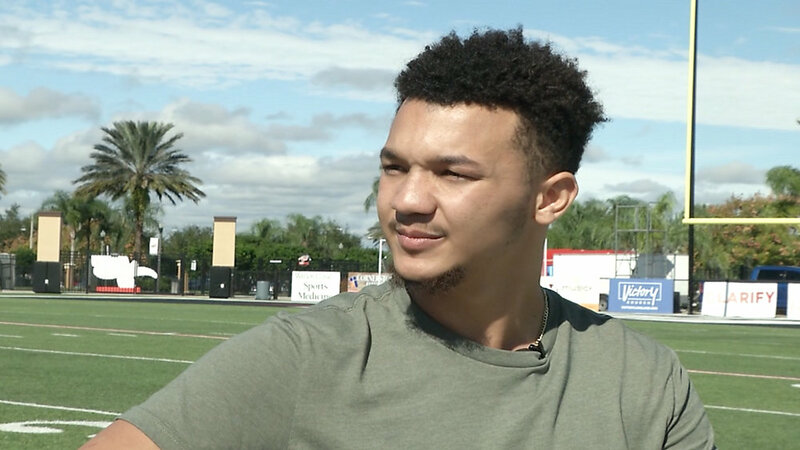 Xavier and his mother both agreed that since his problem has been fixed, it’s time to fix the problem within high school and college athletics and make sure every student-athlete is given an EKG screening for just $15 for each one. "That money was money that I can’t even tell you was so well spent. I mean, it saved my child’s life,” said Marianne. She and Xavier advocate alongside “Who We Play For,” the organization performing the EKG screening. Its executive director, Evan Ernst says any adult having it done for the first time has been put in danger. It has become Evan’s mission to help save lives after seeing tragedy up close on a soccer field in Cocoa Beach. “My little brother’s best friend died on the field with us from a detectable heart condition missed in his physical," said Ernst. Sudden cardiac arrest is the number one killer among young competitive athletes. With a death occurring once every three days. AD, Drew Watson, who brought in the EKG testing for his athletes in 2017. “I think you look at it from any angle and if you’re not doing this, I think you’re dropping the ball," said Watson, who will advocate for more testing in the NAIA Conference. The biggest hurdle for any athletic department is its budget, particularly at smaller colleges and high schools. Marianne and Xavier say that won’t stop them. This mother and son duo say the goal is to have this testing all across the state and the nation. “We test our children’s eyes. We test our children’s hearing in schools. Well then, my goodness, we need to be testing their heart,” said a defiant Marianne. “Make that domino effect in Florida and hopefully other states will see that and the whole United States will be able to make sure it’s a requirement,” said Xavier. Last year Xavier's world was turned upside down. Now, with a new lease on life he hopes to help save other athletes by speaking out from the heart.